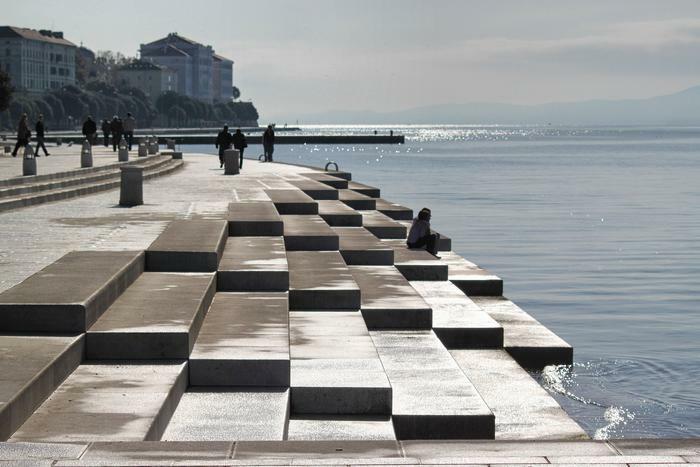 The city of Zadar is becoming more and more popular worldwide due to a truly special monument – The Sea Organ whose name itself describes the uniqueness of this nature-based instrument which combines sounds of sea with the pipe organ. When you step on the Riva promenade in Zadar and realize that the ever-changing, dreamy sounds that you hear are actually being produced by the sea waves lapping against the steps, you can't help but feel mesmerized by its unearthly beauty. And you wouldn't be the only one - shortly after its creation the Sea Organ won the European Prize for Urban Public Space among 207 candidate projects from 31 countries. The author of this unusual work of art is Nikola Bašić, a famous Croatian architect who drew inspiration from his love of both music and architecture. Several other people contributed greatly to many aspects of the Sea Organ: Ivica Stamać, who tuned the instrument, Vladimir Andročec, an expert in sea hydraulics and the whole team from Heferer organ art workshop. So, be sure to book an apartment in Zadar and experience firsthand the magical sounds of the Sea Organ, the pure energy of sea waves and the rhythm of ebb and flow. Sitting on the Riva promenade, watching white sea gulls flying between the blue of the sea and the sky, and listening to the unique and ever-changing music the sea creates is truly a memorable experience. Once in Zadar, you can enjoy yet another breathtaking attraction by Nikola Bašić – the beautiful Sun Salutation, a modern installation which proves that the city found a perfect way to grow and develop on its ancient cultural heritage. So, besides the Sea Organ – the so called "young monument" – there is also the Sun Salutation, located right next to it. This work of modern art is actually an impressive model of the solar system which mirrors the movement of the sun and the planets through a unique light show produced by panels which capture the sun's energy during the day. Needles to say, this is also the perfect spot to enjoy of the most beautiful sunsets in the world. Of course, besides the modern attractions in Zadar you can also enjoy its rich history. Ancient churches and monuments, museums and galleries... It's all there. Centuries old history visible today in the the Cathedral of St. Anastasia, the Imperial Fountain, the Treaty of Zadar etc. Zadar's story continues and grows every day. Be sure to visit it and enjoy its unique charm and beauty.